The MRDA has announced the dates and locations for its first set of playoff events, leading up to MRDA Champs. Get your passports ready, since the three tournaments will be held in venues not located in the United States. The 2017 MRDA Championships will be held in Cardiff, Wales, October 13-15, hosted by the South Wales Silures. This is the first time an international roller derby team championship will take place outside of the Americas altogether. It will also be the first 12-team, 3-day final, as all previous men’s championship tournaments had just 10 teams and needed only two days to complete. Feeding into MRDA Champs will be two additional playoff events, also in international locations. The debut of the MRDA European Playoffs are set for Paris, France from July 29-30, to be hosted by Panam Squad Men’s Roller Derby. A North American regional playoff, set for August 12-13, will be held in Richmond, BC, Canada. The Vancouver Murder will handle hosting duties there. 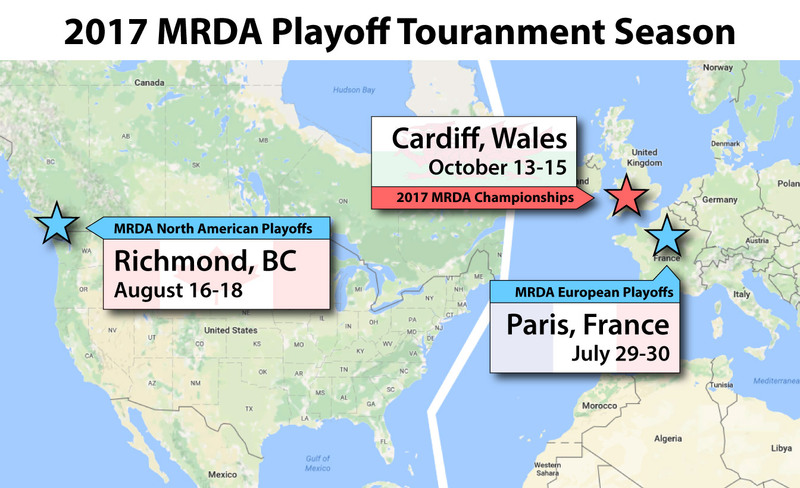 The expanded playoff season comes one year later than originally planned, with the MRDA first announcing it at the 2015 MRDA Championships. The 2016 season ultimately had just the single championship tournament in Texas, after a lack of bids from potential host leagues forced a mulligan into 2017. A lack of bids for this year was also a factor in determining the location of the tournaments. If chatter on social media is to be believed, South Wales was the only MRDA member league to submit a proposal to host Championships. According to sources familiar with the new playoff structure, the top 8 MRDA teams will receive an automatic invite to champs in Cardiff. The two playoff tournaments will be regional, inviting the highest-ranked teams from the Americas and Europe to play in their respective closest location. The top two finishers in each (or next highest finisher, if the winners are unable to attend) will also get to participate at MRDA Championships. Having a playoff and championships abroad is great news for the teams based in Europe, as they won’t have to deal with the monumental costs of travelling across the Atlantic and back. However, if five times as many teams based in North America have to make the same trip—maybe even twice in one year, depending on how the playoff structure works—is that a net positive for the financial well-being of the sport? 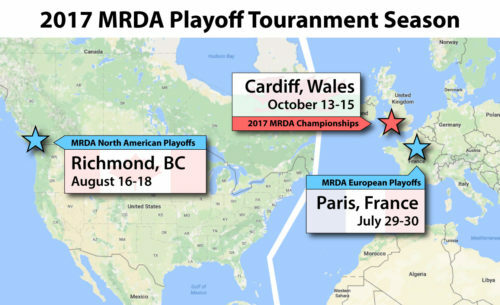 Logistics aside, it’s exciting that the MRDA is going fully international with its expanded 2017 playoff season. We’ll see if this change in format will hinder the St. Louis GateKeepers in their quest to three-peat as MRDA Champions, or if it will give more European squads the chance to make it to Champs for the first time…or dare we say, maybe even win it all. This story was updated on January 30, 2017 with additional information on the playoff format.